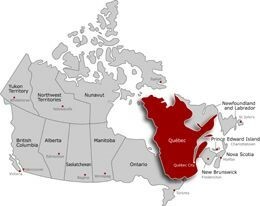 September 14, 2016 – Montreal, Quebec – Critical Elements Corporation (“Critical Elements” or the “Company”) (TSX-V: CRE) (US OTCQX: CRECF) (FSE: F12) and Platypus Minerals Ltd (ASX: PLP) (“Platypus”) are pleased to advise that a diamond drilling rig has arrived on site and commenced drilling over the weekend at the Lemare lithium project. 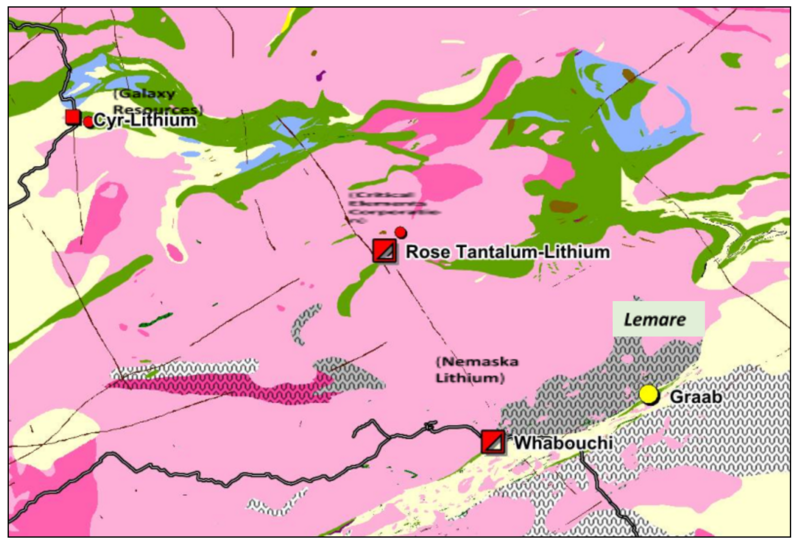 Lemare is located in the James Bay area of Quebec, Canada, in a district containing several advanced-stage lithium deposits (Figures 1 and 2). This work is part of a planned 4,000 m drilling program to investigate the mineralogy, dimensions and extent of the Lemare spodumene pegmatite with a view to defining a JORC Code-compliant resource at its completion. Stage 1 of the program will comprise mapping, prospecting, and approximately 2,000 m of diamond drilling (NQ core) across the known 200 m strike of the pegmatite and its immediate extensions. 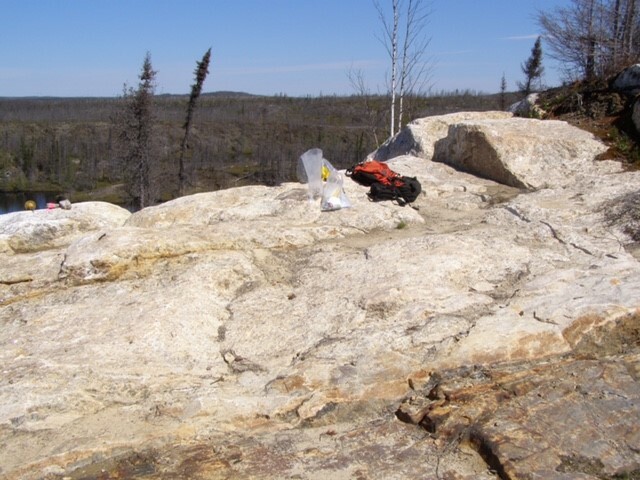 Initial channel sampling from six trenches cut across this pegmatite in 2012 by Monarques Resources returned up to 12 m @ 1.96% LI2O and averaged 10.25 m @ 1.44% LI2O (Figures 3-5; Table 1), as reported to the market on February 11, 2016. Stage 1 is expected to complete by late September- early October, with results anticipated in late October 2016. Stage 2 will be implemented after evaluation of Stage 1 results with the aim to complete by end November 2016. Figure 2. Summary geology of the James Bay region, Quebec, Canada, showing similarity of geological setting of Whabouchi and Lemare on the northern edge of a belt of metamorphosed greenstones (green and yellow) wrapping around a zone of high-grade granulite and migmatite (dark grey). (After Quebec Ministry of Energy and Natural Resources, 2016). Lemare sits 25 km ENE of Whabouchi. Figure 3 Outcropping Lemare pegmatite. 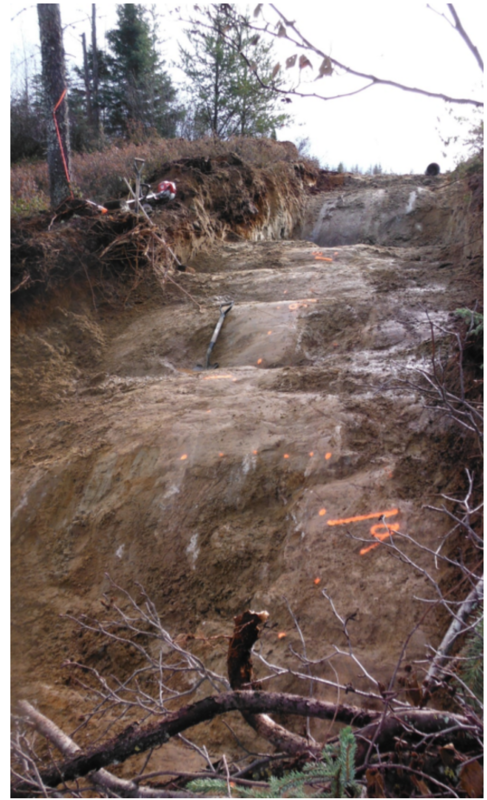 Figure 4 Trench R3 across Lemare pegmatite. 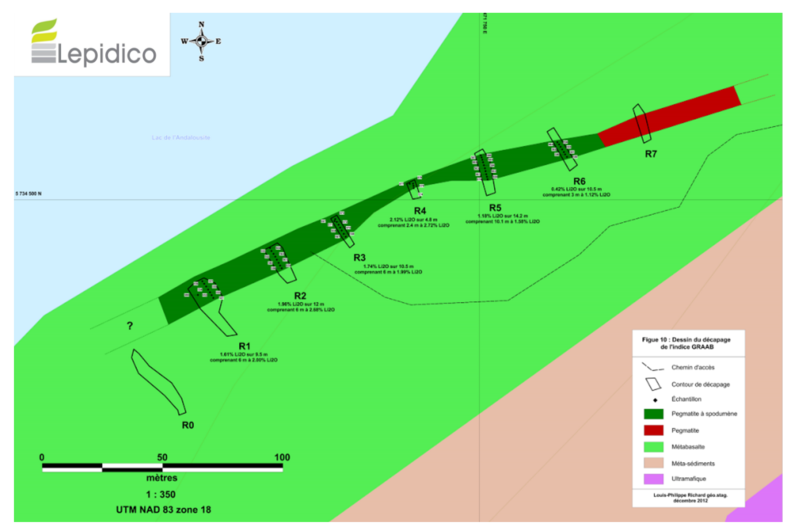 The Lemare project is some 70 km2 in area and is secured by an option agreement (“Lemare Option”) entered into on February 11, 2016 by the Platypus’ wholly owned subsidiary Lepidico Ltd (“Lepidico”) and Critical Elements Corporation. Full details were reported to the market on February 11, 2016. Platypus is earning up to 75% of the Lemare project. As part of the agreed earn-in terms, Platypus has issued to Critical Elements $500,000 worth of Platypus shares (being 18,514,939 shares). To complete the initial earn of a 50% interest in the project, Platypus is to fund exploration expenditure of $800,000 by December 31, 2016, and a further $1.2 million by December 31, 2017. Figure 5. Trenching program at Lemare showing the six trenches channel sampled as per Table 1 (after Monarques Resources Inc., 2012).